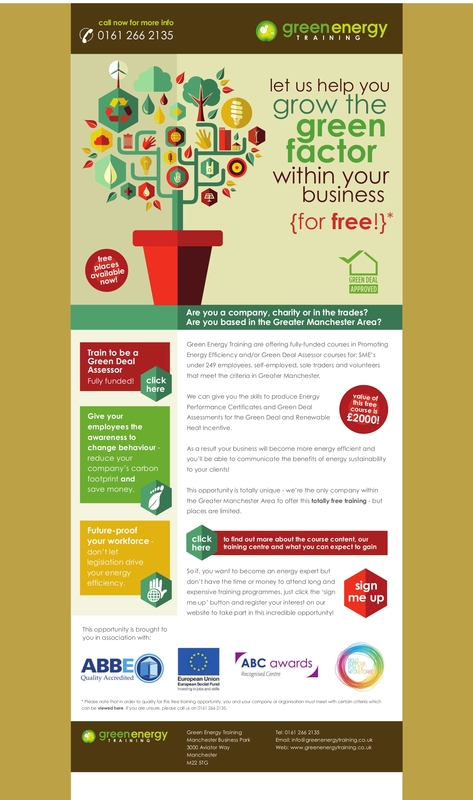 Please could add this following opportunity to your monthly magazine, we are pleased to be able to offer you and your readers this training completely free, the course is open to both existing DEAs’ in the market or new people interested in energy efficiency ,climate change, carbon reduction obligations and renewable technologies. The course is open to employed, self-employed, sole traders and Volunteers working or living within Greater Manchester, SME must have less than 249 employees and t/o under £34M. Please find attached a flyer and the welcome pack that we included on all of our fully funded course(s) that are available to you and your company. The standard cost for our Green Deal Advisor and Energy efficiency course is in excess of £2800.00 and the DEA/GDA Up-skill for £1500 – so you can see why we are being inundated with applicants! Absolutely. We have been successful in securing a limited pot of funding from the European Social Fund ‘Skills for the Workforce’ programme for places of work in Greater Manchester. The only cost to you is your time- however, our funding won’t last forever so we recommend that you sign up straight away to claim your share of the pot – and to start your training immediately. There isn’t. For those of you who are already DEA’s or have a prior Level 3 or more qualification you will have to do a short qualification in Energy Efficiency but this compliments the Green Deal Assessor Course nicely. Furthermore, Energy Efficiency legislation is coming so be one step ahead of your competitors. Sounds straight forward, is there paperwork to be filled out? As with all types of funding, there is paperwork to be filled out and evidence to be shown to prove both your employment status and location. However, we will try to make this a pain-less as possible, as we don’t want throw-away any of this funding on time-wasters. The ESF may also want to contact you or your company to confirm all company details in a short phone call. Great, what’s the next step? Email, or phone me back to confirm you interest. After that, my colleague Jenny will contact you to arrange an appointment time and she will ask you to supply the required evidence. Once you and/or your colleagues have signed you can add new applicants at a later stage – as long as we have funding available. So don’t delay and take advantage of this while you can. I will await your response and we can go from there. Meanwhile, any further questions don’t hesitate to contact me. Time wasters? What, on carbon reduction, energy efficiency and climate change? The word hubris comes to mind.